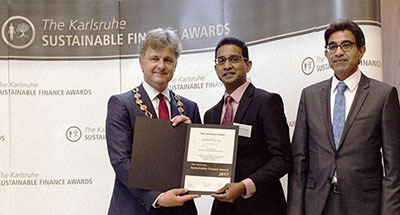 DFCC Bank was awarded a Certificate of Merit for ‘Outstanding Business Sustainability Achievement’ at the Karlsruhe Sustainable Finance Awards, organised by the Global Sustainable Finance Network, which was recently held at the Karlsruhe City Hall, Germany. The Karlsruhe Sustainable Finance Awards honour financial institutions and organisations that have made significant contributions to the field of sustainable finance. Award winners were financial institutions that have successfully embedded economic, social and environmental sustainability into their business, and have made outstanding contributions in the field of sustainable finance. Sri Lanka’s DFCC Bank received the Certificate of Merit in recognition of its success in incorporating sustainability into its corporate strategy and business processes.